It’s been awhile since I blogged. Issues, ya’ll. Anyhoo…. Huh. Then it occurred to me that I often make snap judgments in traffic based on what someone is driving. I mean, you already know what I think about ALL hybrid drivers. Even though I know it’s not true. The Destroyer’s friend’s mom drives one, and she may be the only parent in the school district worth talking to. She actually has a commute where driving anything else would be ridiculous. Oh, and she’s really cool, so I feel cool by proxy. 1) VW bug drivers. They think they’re automatically cute because the car is. They wear clothes that are somehow to big and too small at the same time. They are always on their way to somewhere that was trendy last year. Listen, Bug drivers, unless you are younger than 27 or older than 57, the “cute” is null and void and turns into words like “silly”, and “no”. 2) Honda Odyssey drivers. They try to act like because it’s a nice minivan, that’s it’s not a minivan. Especially the men who drive them. I know that you’re dads, and it’s great that you’re actively participating in parental chauffeuring duties, but it’s still a minivan, homie. Same goes for Toyota Sienna drivers. Also, your kids aren’t better than mine, so stop thinking that. 4) Mini Cooper drivers. 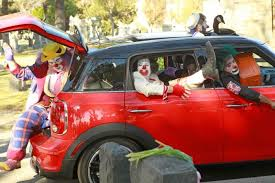 For some reason, they seem to think their cars are not clown cars. Why, I don’t know. If I asked someone to randomly draw a clown car, they would without fail draw a Mini Cooper. Oh, and they seem to believe that driving around with your car painted like a Union Jack isn’t douchebaggery at all. It is, though. You might as well paint Massengil on the side of the thing. 5.) Subaru drivers. They are all terrible people who somehow think that they are saving the environment by driving around with bikes attached to the back of their hatchback. They always wear high waters with hiking sandals, and are always on their way to somewhere that will be trendy six months into the future. Stop trying to get me to trade Gretchen for a hatchback like yours. Remember: lifted Excursions eat their dead. (That had nothing to do with anything, I just wanted to say it). 6.) Classic car drivers. Usually cool cats. Some are older cool cats having mid-life crises. This is case where you have to get a good look at the significant other. If she looks like her name ends with two vowels—definitely mid-life crisis. 7.) Muscle car drivers. I don’t really think anything about them, since I am busy being jealous really hard. That pure, unadulterated jealousy. Except for Mustangs.